Online bingo is getting more popular all the time, and many online casinos are now adding a separate section dedicated to bingo to satisfy today’s online gambler. I actually enjoy playing bingo online more than I do at a bingo hall, the games move along faster and new games start much sooner after a bingo is called. Maybe I’m just impatient, but why wait when you don’t have to? Like the casinos on this website, all of the bingo sites listed below are safe to play at. In fact, many of these bingo sites are connected to the online casinos on this site. It used to be tough finding a reputable online bingo site, but that has changed recently. Enjoy playing online bingo at the trusted sites below. Jackpot City Bingo is another great place to play MicroGaming online bingo. There is no shortage of promotions and special offers for signing up and ongoing promotions just for being a player at Jackpot City Bingo. Like other MicroGaming online bingo sites, you can play 90 ball bingo and various other games. You can play slots, scratch cards, progressive jackpot slots, and more while you are waiting for the bingo numbers to be called. Get $25 free when you deposit just $10, plus get 25% cash back on your second deposit. Jackpot City Bingo also offers ongoing monthly, weekly, and daily promotions for being a member of this great online bingo site. Sign up today and enjoy playing at Jackpot City Bingo. 32Red Bingo is another great place to play online bingo. It was recently added to the online gambling options offered by the well known 32Red group, who started out by running a great online casino. 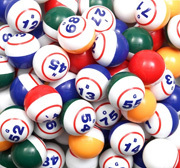 Enjoy 90-ball bingo, as well as several slots and other games. Sign up today and receive a £10 no deposit bonus to try out the bingo rooms and other games. Also, get a 100% bonus on your first deposit up to £100. Based on the reputation of 32Red Casino, it’s not surprising that you get great customer service and fast payouts from 32Red Bingo. They use MicroGaming software, and the only available currency is UK Pounds, allowing you to play the same games with others from all over the world.